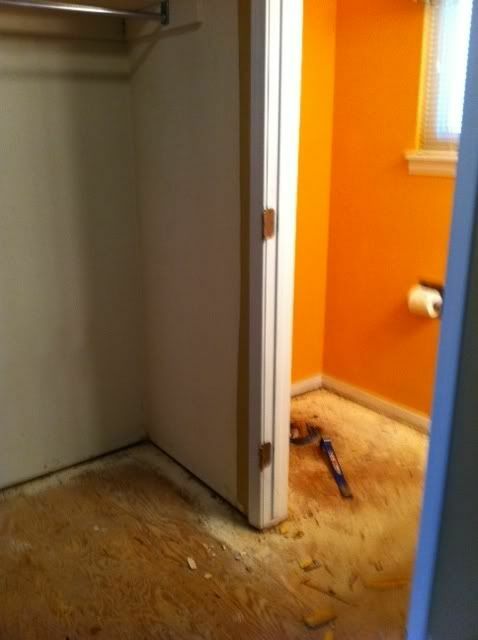 When we bought our home a little over 8 years ago we knew it was a fixer. It was built in the early 80's and came with all of the wonderful architectural details of the era such as popcorn ceilings, dirty parquet flooring and dark oak doors and cabinets. We were 8 years younger then, and Mr. B is a very handy guy and I am a terrific clean up gal, so we knew we could take a rough diamond and polish her up and make this house into our home. Some of the things we tackled on our own were replacing all of the interior doors to white six panel doors. We (meaning mostly Mr. B) painted all of the kitchen cabinets a creamy white. We (again meaning mostly Mr. B) also took up all of the parquet flooring in the kitchen and eating area and put down tile. 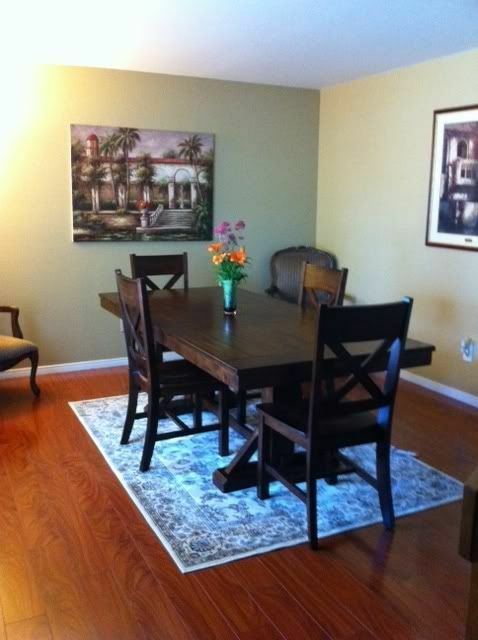 One of the things on our checklist was taking the unused formal living room and turning it into a formal dining room. The living room was really only used once a year, at Christmas, when we moved furniture around and put up the tree in front of the window. 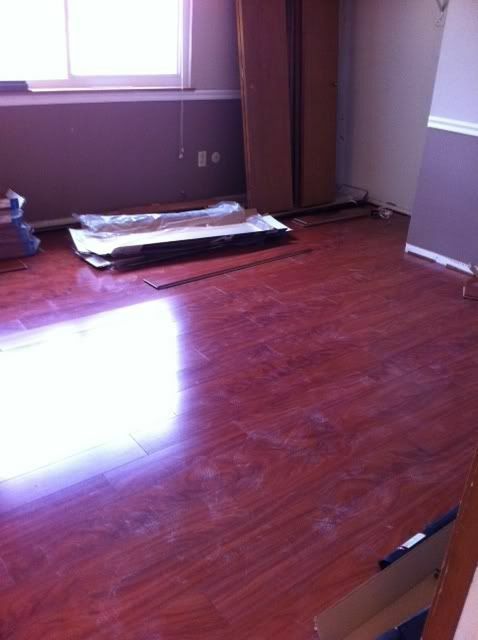 We had already decided when the time came to pull the trigger we would go with a good quality laminate wood floor. We also decided that we would not only do the living room but also the entryway, powder room, family room, the hallway on the second level and Mr. B's office. Having already gone through the month long tiling project, and our schedules being busier, we decided to pay the extra money have someone else do the installation this time. We spent time looking for the laminate we both liked. We went to every home improvement and big box hardware store in the area. 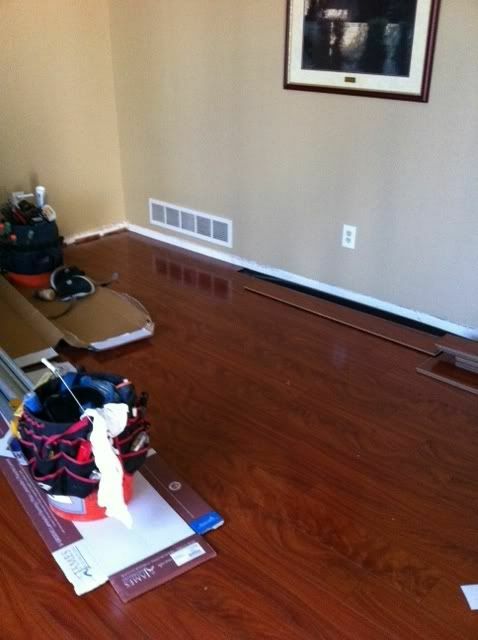 We wound up choosing a 12 mil African Mahogany from Lumber Liquidators. When we went to place the order at the showroom we were given two pieces of good news. First, it was on sale! My two favorite words since Mr. B said I do. The second, installation would only take three days. 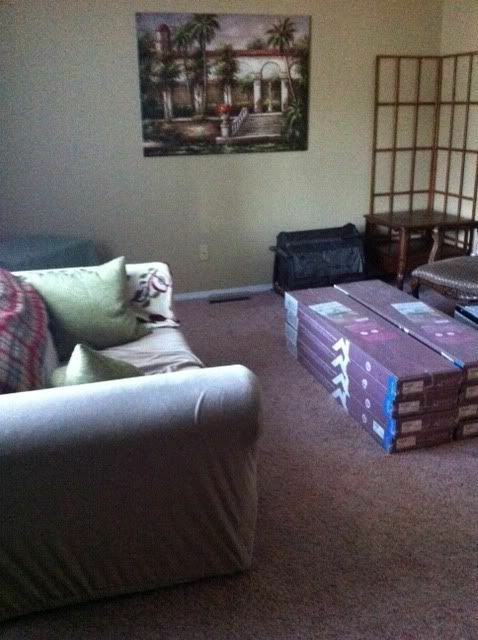 We Craiglisted the furniture we didn't want to keep and prepared the house for the demo process. 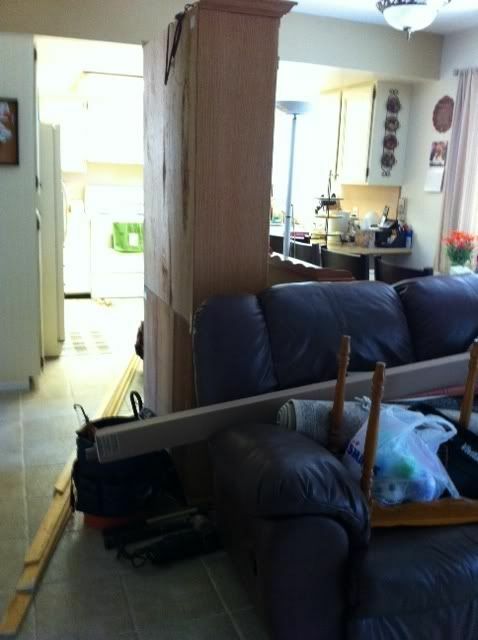 This involved moving everything we had left into the kitchen and dining area. 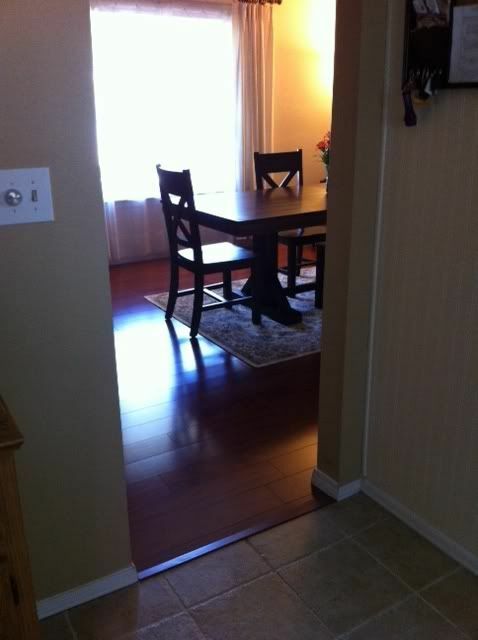 Mr. B's office furniture was crammed into every available space upstairs including the guest bathroom. 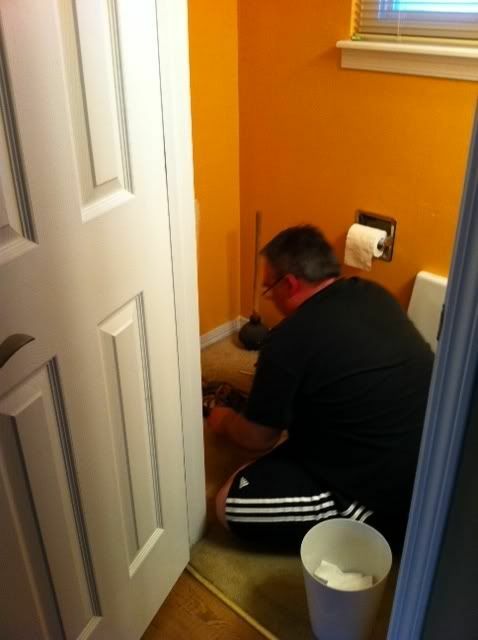 It also meant that the toilet in the powder room had to come out. 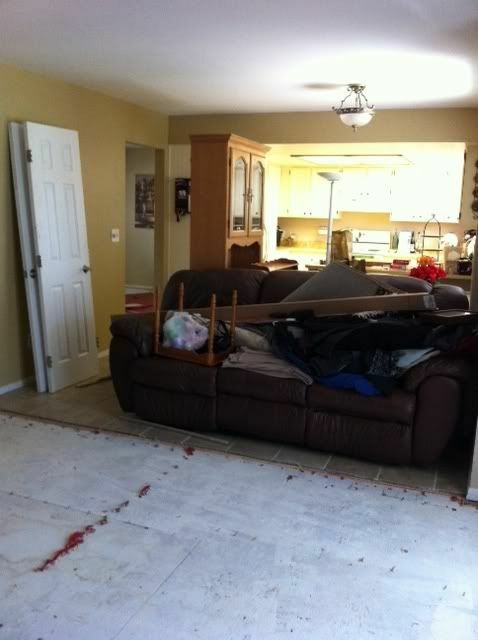 Yeah, pretty much a mish mosh of sad, ugly furniture, well, except for the two arm chairs. While the couch etc. was leaving for good, they would stay. I don't have photos of the other rooms. It was before I had starting blogging and I didn't think of the importance of before photos. Lesson learned! 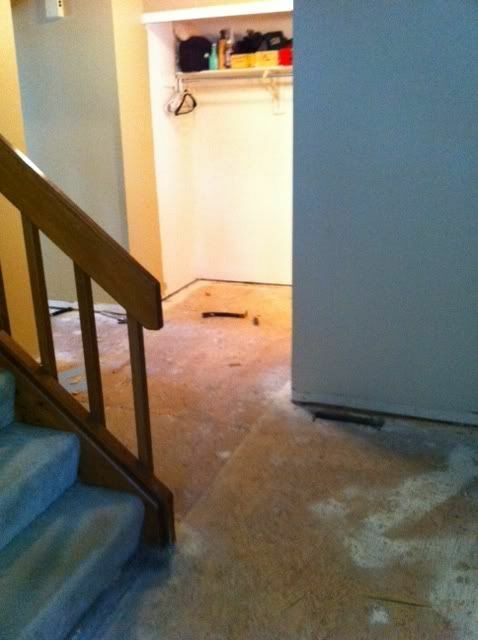 Before we knew it, the day had come for demo'ing the carpet and baseboards. It took the two man crew all of the first day. It was a very noisy process. Luckily we had arrange for some friends to take Max for the week. He is not good with loud noses. We had taken the week off from work and made ourselves comfortable downstairs in the home theatre. Looking at everything after the crew left we weren't really convinced that they could pull all of this off in three days. So day one was done and the place was a dusty, dirty mess. If all went as promised, only two more days to go. Day two started with only one guy showing up. We didn't think this was a good sign but he worked like a man with a mission. Which he had. They are contracted and paid by the job. The sooner he was done with our project, the sooner he could get on to the next one. A young man with a great work ethic, and a family to feed. He stayed until after six that night. We thanked him by ordering pizza and inviting him to join us. In spite of the dust and mess we were pretty excited! Day three, the final day? Both of the guys showed up and went right to work. The day was filled with the sound of hammers pounding and the whine of saws in action. At seven that evening, they shouted down to us that they were done. Seriously? They did all of this in three days? Yes, they had, and they were pretty darn proud of themselves of the work they had done. We were proud of them too. It looked amazing! Better than we even imagined when we first dreamed up the idea. 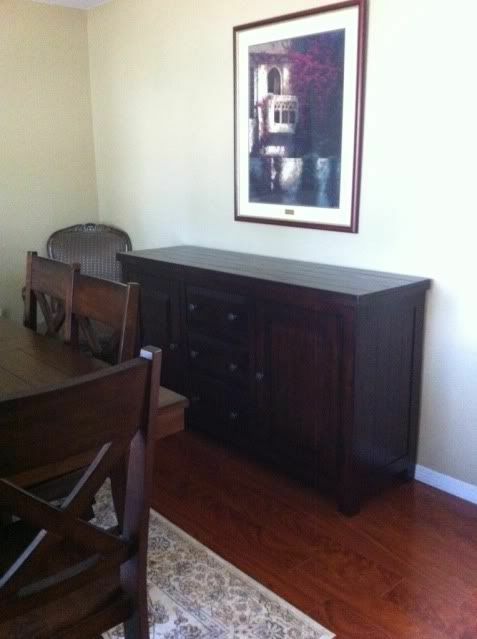 And with the addition of the new buffet (you can read more here). With this project finished, we are much closer to buffing this gem of a house into the warm, welcoming home we both talked about over 8 years ago when we first walked through the front door. 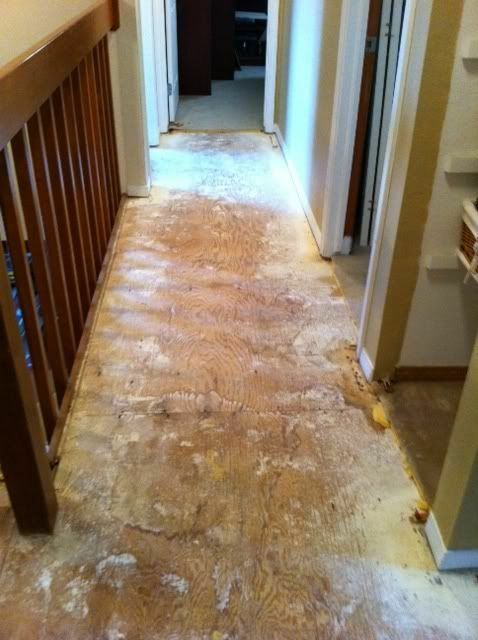 I totally know and understand the mess and disruption putting in wood floors can create. What a fantastic transformation. Hi Kathe! What a job you tackled but oh so worth it. 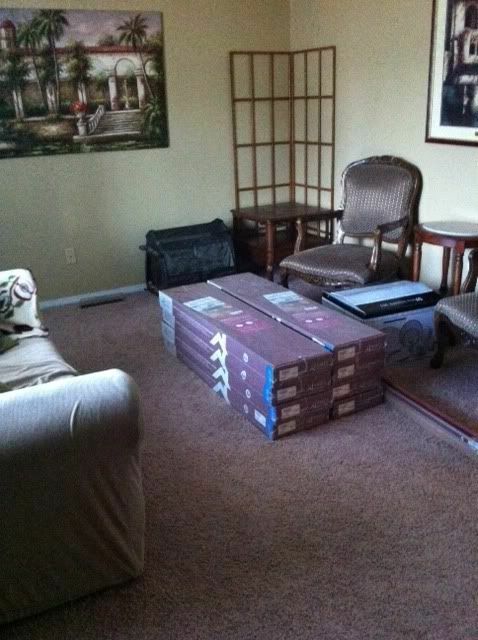 Your new floors are so fabulous. Thanks for sharing with my newbie party. Hi Kathe! You have my sympathy! 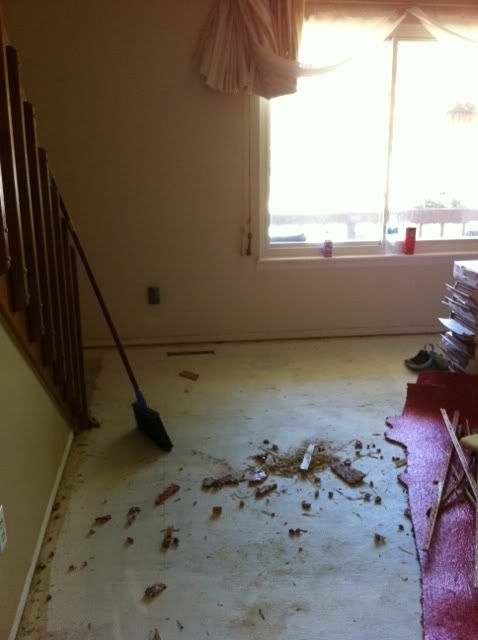 I detest having my house torn apart for repairs or remodeling. Your home looks wonderful and I'm happy for you. I'm you newest follower and hope you come follow me. Oh my goodness - it turned out beautifully! Congratulations! What a transformation (and a mess in the process)! The floors look gorgeous. Thank for linking up at the It’s a Wrap Link Party at Artful Rising. Wow! exciting! I have rehabbed houses so I know exactly what you're talking about, what you've gone through. Oh the mess! And how it gets worse--and even worse! And then! beautiful! You must be so happy! Kathe, this was so much fun to see from the comfort of my own home and not having to put up with the dust and noise! Your wood choice is just beautiful. What a glorious difference it has made. 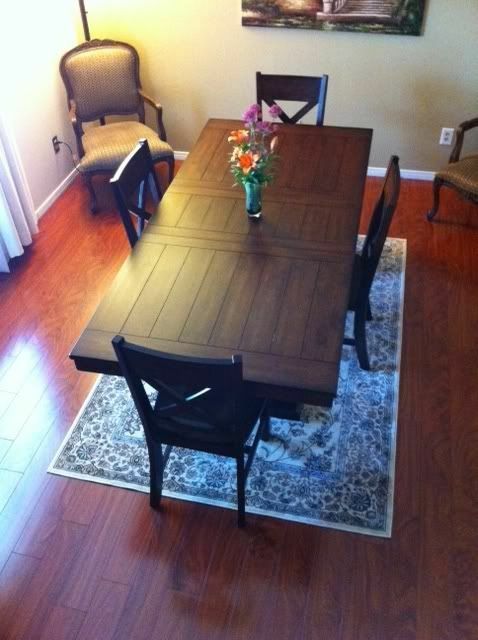 Your dining room looks great, and your chairs look very happy to have escaped craigslist! Thank you for sharing! 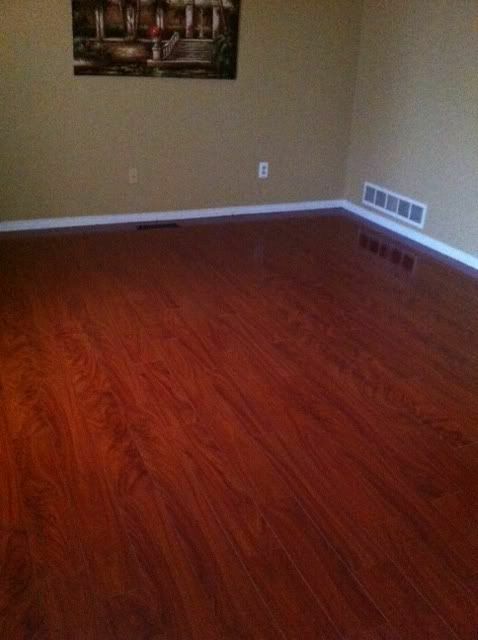 Oh, your new floor turned out GORGEOUS! 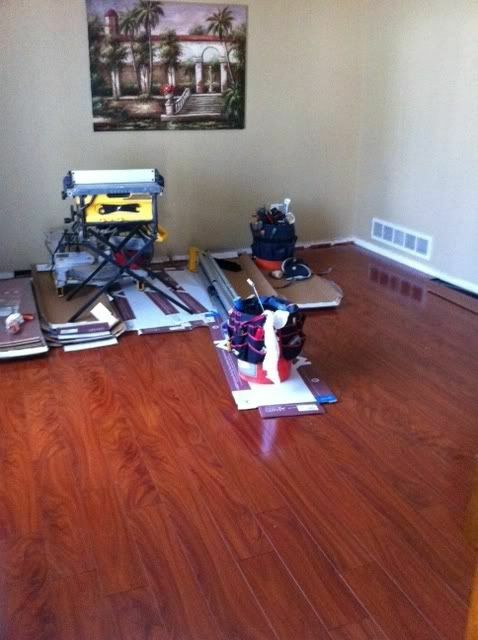 the floors are beautiful and it looks like a lot of work, but worth it! It's beautiful. Are you inviting the team for dinner? Beautiful!I couldnt stand the mess but the end result is worth it. Beautiful floors. I understand about mess, it's hard to get through, but the end result is so worth it. Great job! Wow girl, what a difference! It a beautiful transformation. Love , love the dining table. 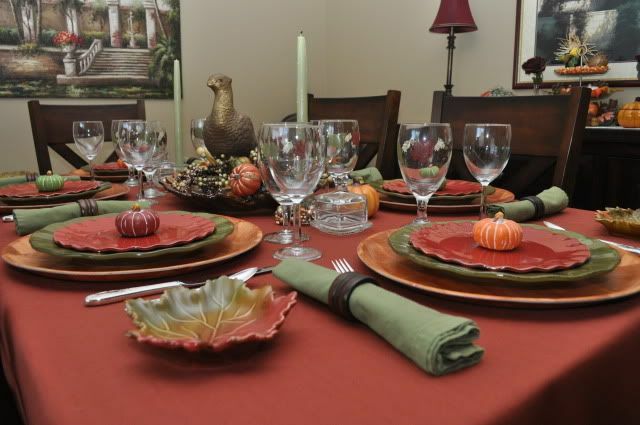 What a wonderful Thanksgiving dinner you could share there! wow! Huge improvement. 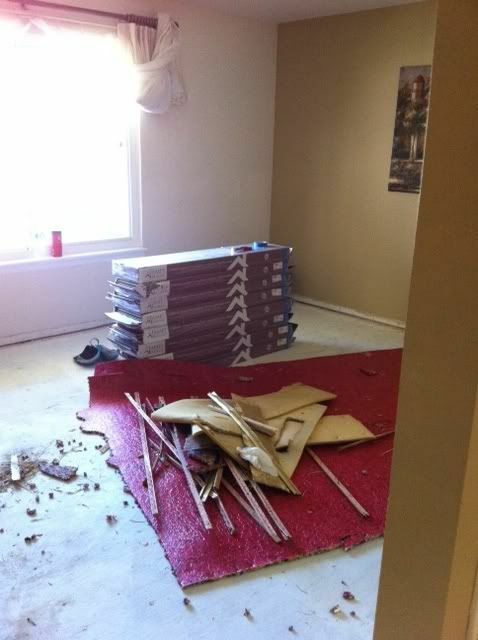 There for a minute, I thought you were going to leave us hanging and not show us the after! Talk about anxiety. lol! I , also, love your kitchen table! What a big improvement, looks great! Hope you can stop by and say hello and follow back. Thanks and have an awesome day. My! It looks marvelous! I know you absolutely love it. Wow! So awesome! U guys make an awesome team. Hopping over form the Welcome Wednesday Blog hop. Now following u via GFC & Liked U on FaceBook! I absolutely love your new floors. 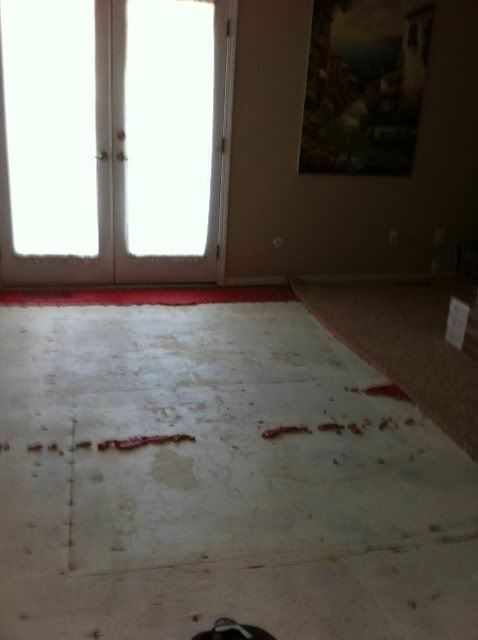 We need to repolish our hardwood floors, and I am STILL waiting for the tile in my garage to become the floor in my kitchen. Patience is a virtue, right? I must be really virtuous about my kitchen floor. Ha! It looks great, Kathe! Just think how much you are going to enjoy the holidays this year! What a difference a day (or three) make! Wow and wow. The floors are just spectacular. I really appreciate you linking this gem up! Beautiful! You have a lovely home. I'm here from Kristen's party and I'm a new follower. Hope you stop by for a visit sometime! The floors are just beautiful!! It's always such a mess and hard work to do, but oh so worth it!! Thank you for linking to It's a Party! Beautiful! Aren't you just tickeled pink over this! 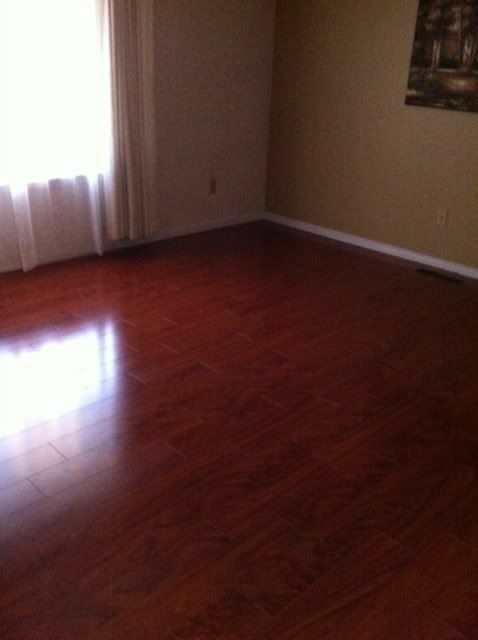 Wow your floors looks amazing! I love hardwood floors. I'm Sarah, I'm a new follower through the Welcome Weds hop and wanted to invite you to come follow me back. I am following through both GFC and Pinterest. Thanks and have a wonderful weekend. What great results. I am sure you are very pleased. Thanks for linking to Things I've Done Thursday. What a transformation! Love the floors. I'm so excited for you! 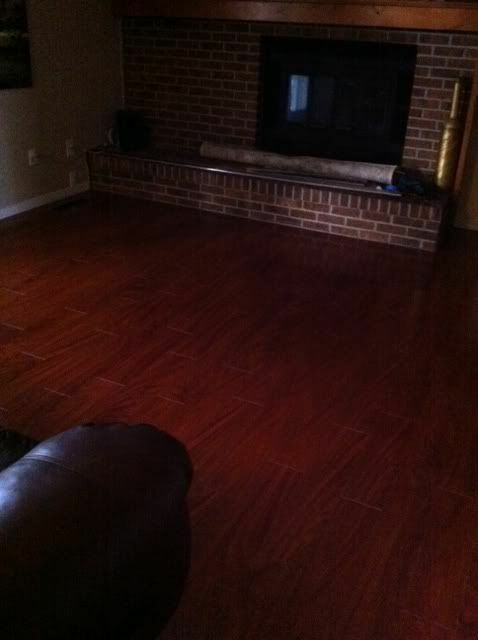 New floors are awesome! Holy cow what an undertaking! They look awesome and were definitely worth the hard work! 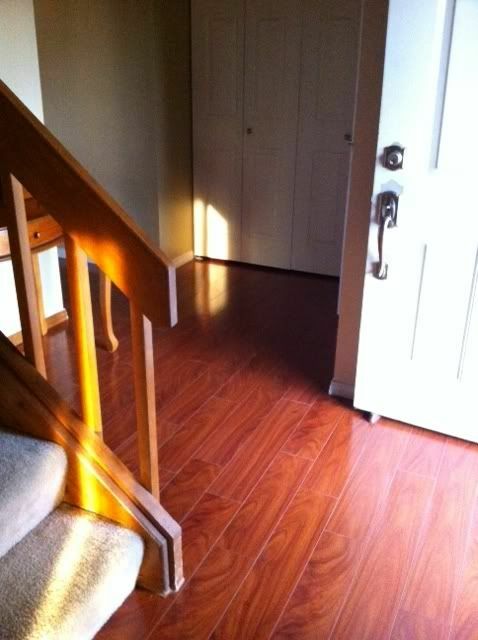 Love how your beautiful floors came out- absolutely lovely!! Thanks for sharing at Feathered Nest Friday! beautiful floors! 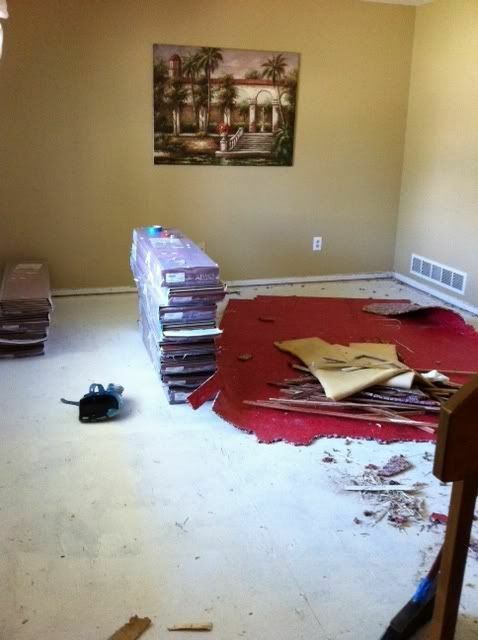 home reno--pain in the tush, but so worth it!